One of the most common questions I am asked is: What's the best way to frame this? Hopefully this guide should help. There are a few schools of thought about framing. I think the best way to frame is to ask yourself what is the most important part about the piece to you. Is it that it is a paper cut and has positive and negative space? Or is it the design with a backing color that really makes it pop? If it's the paper cut portion that really sells it to you read that section. If it's the design, read that one. Not sure? Judge the merits yourself. There are no right or wrong answers here, but a lot of awesome possibilities to explore. What makes a paper cut so visually appealing is the use of positive and negative space.. The positive space is the road and map portion below, the negative is where the paper has been removed. This removal means that all sorts of changes can be made with depth, light, shadows, and color. To maximize this, I recommend framing between two clear pieces of glazing (the see through bits, glass or acrylic, usually). These two pieces provide good examples of what I mean by using dual pieces of glazing. On the right is my favorite type of frame at present an A3 size made using four pieces of grooved wood and a giant sturdy rubber band. The paper cut is float mounted (e.g. it appears un-adhered to anything) between the two pieces of glazing. The paper is not in fact held in by anything other than the sandwiching action of being pressed together. The A3 size means the A4 piece of paper has a lovely floating space around it, giving the piece quite an airy feeling. 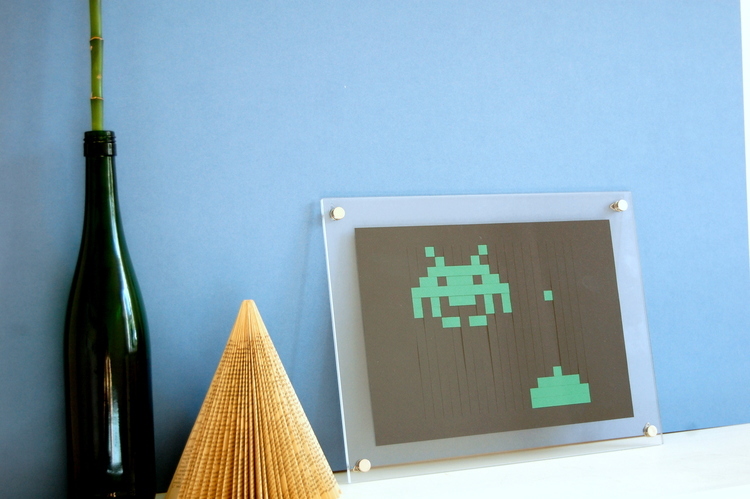 The space invader is framed in a standard acrylic frame, this one I bought at Muji. The joints screw together and hold the art work in place. Again this isn't adhered in anyway inside the frame, but held in place. This frame has options where it either has a foot that projects outward so it stands alone, or you can thread a hanger through the back of the metal screw loops to hang it as you would a traditional frame. This is a larger piece 22" x 30" and I've framed it in a custom made frame. You can see that there is a blue mount around the piece but that you can still see through this. I purchased a second sheet of acrylic (the exact same as the front side) and placed it at the back meaning you can still see through the negative space. This might be more obvious, or at least more interesting, if my rented walls weren't covered with magnolia painted chipboard wallpaper. I suspect yours are better. This map is adhered to the mat using little pocket corners. This means it stays in place without using adhesive that might compromise the artwork. My larger map pieces are constructed as if the white paper border is a piece of matting, so a mat is not essential, merely one of many options. 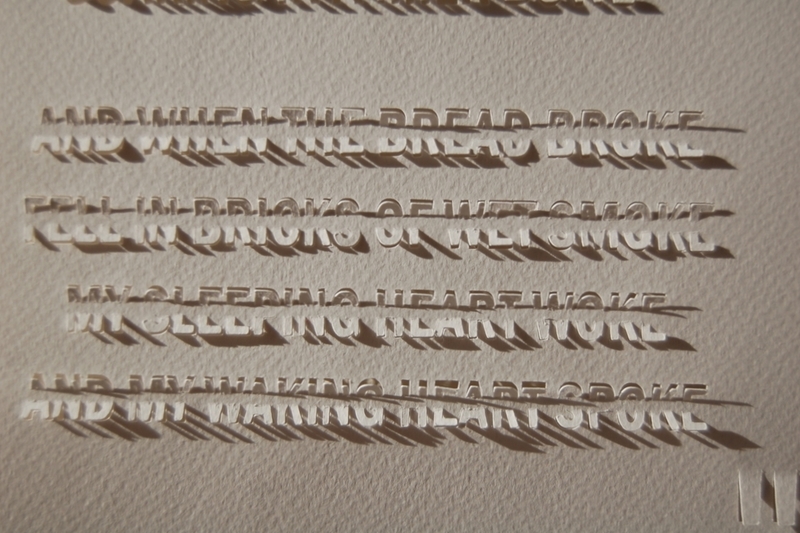 What this means in practice is that I get the effect that I most enjoy about paper cutting: casting shadows on the wall. This sort of effect also works when using only positive cutting as below. I would recommend framing this sort of text piece, as I did, in a shadow box. The other dominant school of thought is about making the most of the potential negative space by filling it with a color. I have done this in various paper cuts, and it matters for various reasons. It might match the decor of the place you want to hang it, or the color might mean something in the context of the work, or you just like it that way. You do you. The dominant drawback is that the fact that the piece being framed is a paper cut becomes less obvious and looks, at first glance, more like graphic design. This piece is framed in a traditional manner. The paper cut simply sits on top of a really awesome sheet of gold paper from GSmith papers that really brings this paper cut into Art Deco territory. It might look more like an Islamic screen if it were mounted without the paper. Perhaps it is just a compelling geometric pattern. Again, it helps to think what you want the work to do in your home or someone else's. The versatility of the paper is one of its enduring strengths and constitutes no small part of its visual appeal. On the top left is a bathymetric map (one of sea floor depths) of New Zealand. It is a layered paper cut piece, and does well without any sort of mat around it. On the top right is one of my early Circle Series pieces, and it used a light non degrading adhesive to stay in place. It also did not require a mat and looked great without it. I might, now, have chosen a slightly thinner frame as it makes the piece look a bit squashed. I think the thicker frame works nicely on the lower left piece, but again on the right I'd choose a thinner frame. The green in the flight path piece could be altered to anything as it is unadhered and how the vast majority of my pieces are sold. Here are examples of what adding a mat to the layered work looks like in both white and black frames. These are the most common type of framing options. These are examples of one type of map, that of London, backed by a fire engine red A4 piece of paper. There are various matting options at work, including the double mat (the thin black line around the paper cut). Double matting is better when you have a lot of white to help emphasize or break up the white surround. As you can tell the white of the frame and the brilliant white of the mat make the frame look cream, which was not the original intention. I ordered these frames custom online, but that's the difficulty with buying online, it looked fine when I selected the options, but wasn't as good when it arrived. 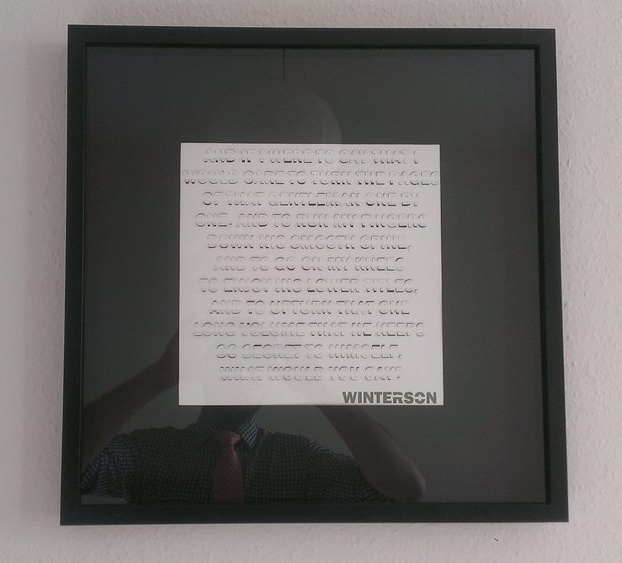 It still suggests what a white frame, white matting, and a white paper cut might look like. The last photo compares the two. This is an example of what the double matting looks like with some of my larger pieces. I particularly think the black frame with white mount board and then the thin black edge works best. If I was displaying it in a gallery this is what I would choose if I was backing the pieces rather than float mounting them between acrylic or glass panels. Ikea: The shadow box frame for the text paper cut is from Ikea. I believe it cost £12 and the glazing is real glass which makes it heavy, but durable. I often make my larger 305mm x 305mm (12" x 12") pieces to fit their frames because the larger the piece, the pricier the frame. Frames.co.uk: When I create custom frames, particularly for my larger pieces I often buy them from this online retailer. They make the frames themselves up north and they are quite decent quality with a good price tag and often free shipping on any order over £35. I have had a few issues with some frames, but they always fixed it by sending a new one, so I keep returning. Muji: Muji provide a variety of high quality, inexpensive acrylic frames. Moebe: This is the company that produces the A3 float frame I use.